1. The West Virginia Legislature is in its final days. It appears that no bills directly impacting anesthesia care will pass. Alex Skaff, MD, his Charleston partners, and state medical association staff deserve much credit for monitoring and working to improve bills of concern. Some healthcare bills that could pass include a work requirement for Medicaid recipients and raising the smoking age to 21. Legislators spent much of their time debating controversial campus carry of guns and teacher raises with educational reforms. A. The ASA Annual Meeting will occur in Orlando this year, October 19-23. Educational sessions will end on Tuesday, with only the House of Delegates session on Wednesday. Few attendees have stayed for the Wednesday educational events in past years. In 2020 the House of Delegates session may move to Tuesday afternoon. B. Directors approved an updated budget for this year of $53 million. C. The most hotly debated item was guidance for a revision of the Anesthesia Care Team statement. It reflected the significant differences in anesthesia practice patterns across the country – from anesthesiologists who do their own cases and think it unacceptable to leave a patient alone during surgery with a student nurse anesthetist to anesthesiologists who routinely staff ORs with 1:2 direction of students. A proposed statement revision will likely renew scope-of-practice debate at the Annual Meeting. D. The second most debated item concerned rules on running for ASA office. Revisions include limiting candidate announcements to 3 years ahead of the election and officers running for First Vice President not presenting the ASA update in any states the year they are running. E. ASA membership continues to increase (53,499 at end of 2018), but at a slowing rate – a general concern. Studies show that nearly one-third of physicians practicing anesthesia to some extent do not belong to the ASA. Society leaders are studying how to make ASA more valuable to anesthesiologists. 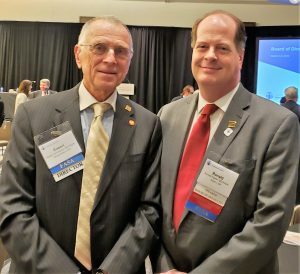 F. The ASA Political Action Committee set a new record last year, with 8534 contributing $2.29 million, increasing the influence of anesthesiologists to improve anesthesia care. G. Drug shortages, opioid epidemic, and out of network billing were major issues ASA leaders addressed in 2018. H. 20,000 anesthesia clinicians from 575 practices now submit data to the National Anesthesia Clinical Outcomes Registry of the Anesthesia Quality Institute. I. 29,000 learners used ASA’s 350 online courses in 2018. Anesthesia Sim STAT was the surprise educational success. 3. The ASA will hold its annual Legislative Conference in Washington DC on May 13-15. So far six West Virginia anesthesiologists have notified the WVSSA they plan to attend. The WVSSA will pay the registration fee for each attendee, as well as $250 towards a hotel room and for a group dinner. Find more information at, https://www.asahq.org/meetings/legislative-conference. Please let the WVSSA Secretary know if you would like to attend. 4. The annual WVSSA educational and business meetings will be at the Greenbrier on August 24 and 25. The meeting is free for all WVSSA members. Below is the planned educational meeting program. 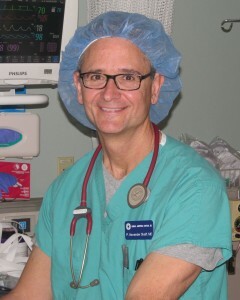 Ron Harter, MD, FASA, ASA speaker, will present the ASA update at the WVSSA annual meeting. He is pictured at right meeting with Dr. Johnstone at the Board of Directors meeting this weekend.